No account of the history of the Naomh Maur C.L.G. club can be given without first acknowledging the wonderful publication in 1961 by MicheÃ¡l Clerkin called, "The Saint Maur's Gaelic Football Story". This publication is lovingly referred to as "the two and six penny book", which was the cost, in pre-decimal currency, of the book and is displayed on the front cover as 2/6. This equates to twelve and a half pence or 0.16 Euro. The following account of the club's history has been compiled by Leo Bisset. Naomh Maur G.A.A. club is based in Rush, Fingal, North County Dublin. Rush is a farming and market gardening area, seventeen miles from Dublin City. Football was played in the area between local Parish Teams prior to the foundation of the G.A.A. in 1884. It is known that a Club called "Emerald Isles" existed in around 1900 but there are no records to support this. After an unsuccessful attempt to set up a Club between 1914 and 1919, local Curate Fr. Skeehan organised football games in the local school. In 1928 however, two GardaÃ­, Tom MacCarville and Peter Fallon, who were stationed in Rush, and local G.A.A enthusiast Mick Jones called a meeting. 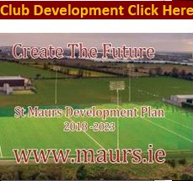 The meeting was held on 28th of June 1928 and St. Maurs G.A.A Club was founded. Mick Jones was elected Chairman and our Club colours were a maroon jersey with a gold diagonal sash. These colours remain with the club to the present day. The early years of the Club were fruitful ones. In our first year we won the Division 3 Championship and progressed to win the Division 2 title in 1929/30. St. Maurs entered the Division 1 league in 1930 and subsequent to this our "Big team" or "A team" never played below this level. In 1936 our Club embarked on a tour to Liverpool to play a game against a team of Irish farm workers. St. Maurs won the game. The Club, under the guidance if Mick Jones, had built a solid foundation and would continue to grow. The 40's were a quiet time, with a lot of our founder players "hanging up their boots", but they gave a great assistance to a crop of young players. Pat Butterly succeeded Mick Jones as Chairman in 1949 and did Trojan work with the young players.They qualified against all odds to play in the Dublin Junior Football Championship but lost out. However the Rush spirit saw them go one better in 1951 and on the 23rd of December they beat Skerries Harps in Parnell Park give us our first Dublin County Championship in 1951. This game is still spoken about as a huge crowed packed to Parnell Park to see the game. St. Maurs won by two points. One of the players who really caught the eye was Seaamus (Jim) McGuinness and he soon progressed to the Dublin Senior Team where he became one of the finest footballers of that era. Unfortunately injury cut short his Inter-County career but not before he won a National League medal and played in the Semi Final against Kerry. Liam (Willie) Price was elected Chairman in 1950 and over the next forty four years he led the Club with great skill, style and dedication. After the Club won the 1951 Championship, the target was set by Liam was to obtain a pitch. When the land of the Parmer Estate became available, nine arces on the west side were purchased from the Land Commission in 1958. With the willing hands of the Rush men, the field was turned into one of the finest pitches in Ireland. The pitch and new dressing rooms were opened in 1961 with Dublin and Kildare playing in a Senior Football Challenge. During the 60's the Club established a good Juvenile section and by the late 60's things were taking shape. The 70's brought a golden era to Naomh Maur. 1972 saw the Club win its second Dublin Junior Championship and in 1973 Senior status was achieved for the first time by winning the Intermediate title. The Club stayed Senior for eleven years and won a Senior League title during that time but fell back to Intermediate football in 1985. This was a short stay and in 1986 the chance to go Senior came again. We qualified to play a rejuvenated and star studded Garda team in Croke Park. The Garda Team included Ashley Sullivan (Wicklow), Davy Byrne (Monaghan) and John McGrath (Tipperary) but against all the odds Naomh Maur won by 2-8 to 0-10.The final was against Round Towers of Lusk. Great friends and neighbours and a few relations playing against each other. The final was played in The Naul and a massive crowd were present for a superb game which St. Maurs won by 11 points to 6. During our 1st spell in Senior Football the need for a Clubhouse was realised and our fine Clubhouse, Ãras Naomh Maur, was opened in 1983. A huge amount of hard work was done by the Committee and the kindness and generosity of the people was amazing. The Club now had a top class Handball alley, Squash court, three Badminton courts, Basketball court, kitchen, changing rooms, meeting rooms and a Lounge Bar. The Club remained Senior for a few years but slipped back to Intermediate football. The 1990's brought about many changes and a big juvenile policy from 1993 will no doubt bring us back to Senior football soon. 1994 saw the end of a forty four year term as Chairman for Liam Price. It would take many reams of paper, and a lot of bytes, to recognise what this man has done for our association and our Club. Suffice to say the work of Liam and the Committees he chaired have given us a marvellous facility. Liam beacame Club President and was as active and as wise as ever and is ever-present at all games. Brendan Harpur took over as chairman in 1994 and served for three very fruitful years. Brendan gave a very big emphases to juvenile development and coaching. A native of Co. Tyrone, Brendan was the first person from outside our parish to hold executive office. Brendan also coached our 1st football team. In 1997 Maureen Bollard took over the Chair of the Club for one year and spared no effort with her team. Maureen came from a great football background. Her father, Rupert Newcomen, played for St. Maurs and her uncles, Pat and Jackser, were voted players of their time. Jackser captained the 1951 Junior Championship winning team. Seaamus Carton, a native of Lusk, took over the Chair in 1998. Seaamus, a noted hurler and goalkeeper of our 1972 and 1973 team and Inter-County referee, was a pleasure to work with. He was softly spoken and things were done without a fuss. Seaamus died during his term of office and this really shook the Club. Seaamus made an incredible impression on anyone he met and is sadly missed. John Keely was elected Chairman in 1998 for a three year term and his energy and enthusiasm knew no bounds. During his term of office our Club Lounge has been refurbished and our new development plan will be launched. The 1999/2000 season saw us enter a Junior hurling team for the first time in the Dublin Adult League and 2001 saw us win the County Dublin Junior C Division 3 hurling title. This has added a new dimension to a very proud Club with a very proud tradition. 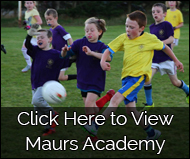 St. Maurs, like many other Clubs, have family names associated with it from the founding of the Club. These include names like Bollard, McGuinness, Price, Rennicks, Kelly, Devine, Weldon, Butterly, Farren, Walsh, Wilde, Ferguson, Newcomen, Leonard, Bissett, Flynn, Monks, Sweetman, Carrick and Clerkin. These names are as synonymous with St. Maurs as O'Sullivan or Spillane with Kerry, Murphy or MacCarthy with Cork, Loftus or Flanagan with Mayo, Stockwell or Purcell with Galway, O'Neill or Jones with Tyrone. Naomh Maur has grown quite a bit since 1928 with the help of great people and will continue to grow with the help of great people to lead us in the future.